Towards the end of our leisurely lunch, two waiters approached our table. "Hey," said one, "we were just wondering, what's with the case?" He was eying the big orange box in the middle of the table. It had remained mysteriously closed throughout our long lunch, but now it was open and brimming with watches, and they were curious. Who was this guy I was sitting with? Was he selling me a watch? His whole collection? We explained that this was not a sales transaction, but that these were indeed samples of watches that are for sale. One of the waiters was a bit of a watch aficionado himself, and he asked my lunch companion what his favorite watch company was. He chuckled, "I guess I should really say my own." I had been munching French fries with Pete Brown, the man behind Hager Watches, of Hagerstown, Maryland. He had brought with him a case full of his company's watches, both production models and experiments. We chatted with the waiter a bit, compared the watches on our wrists (Pete's Hager S.E.R.E., my Halios Tropik B, and our waiter's Citizen Eco-drive titanium), then a wry smile crossed Pete's face. "So," he asked, "you want to see something no one else has?" He pulled out a small leather travel case from behind the big orange hard-shell. This was the main attraction, but we will get to that later. Pete was not always a watch guy. In service in both the Army and the Marines, he wore always wore a G-Shock. Once out of the military and into civilian life as a defense industry consultant he bought his first "nice" watch, a well-known fashion brand, paying the full $400 retail at a department store for a quartz made in China. 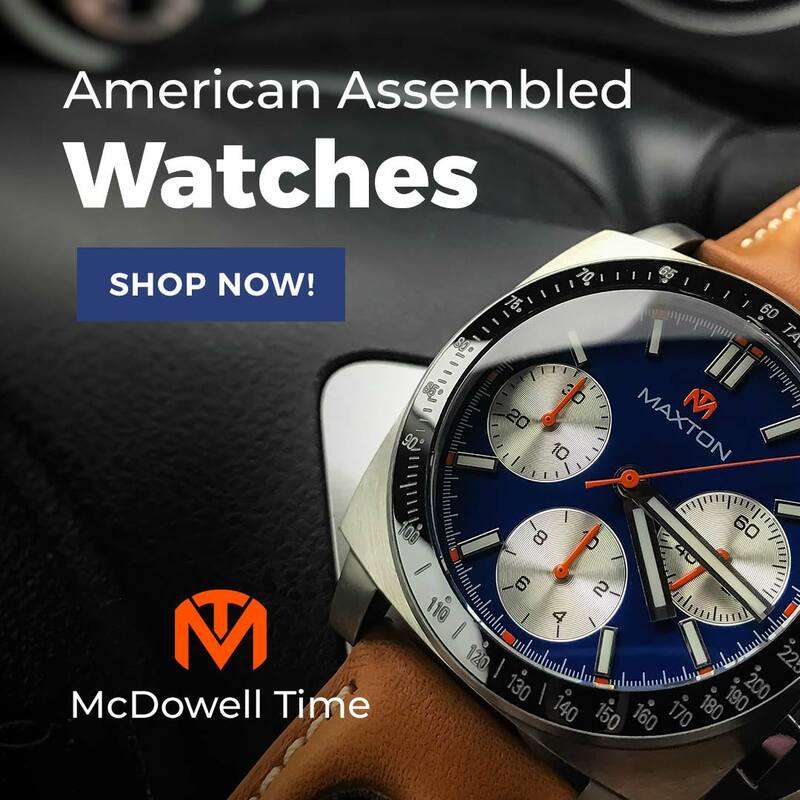 When it broke two years later, he started researching watches and discovered the online watch hobbyist community, and with it, the joys of automatic movements and the reverence for Swiss manufacture. "It made me wonder," he said, "if all these companies were using the same ETA 2824, why the big difference in prices?" Further research uncovered the peculiar world of watch making, the foibles of luxury marketing, and the availability of alternative movements. He finally concluded that if he could source the right parts and suppliers, he could produce quality watch for much less. The first Hager was the Commando, a 100m automatic dive watch powered by a Sea-Gull TY2806. It is still available for $260. Pete initially tried funding the watch through Kickstarter, but they rejected it. "They were still new and they said they weren't interested in watches." He says. "Now I see all the watch projects that have launched there, and it's amazing." The Commando may not break any new ground, but it is a handsome watch. 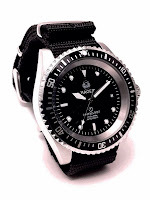 The design borrows liberally from the classic Rolex Submariner, particularly the highly collectible 5517 Military Submariner supplied to the British Ministry of Defense in 1970s. Its stainless steel case is both polished and brushed, measuring 40mm wide and 13mm thick with 20mm lugs. A large screw down crown sits at 3:00, flanked by crown guards. 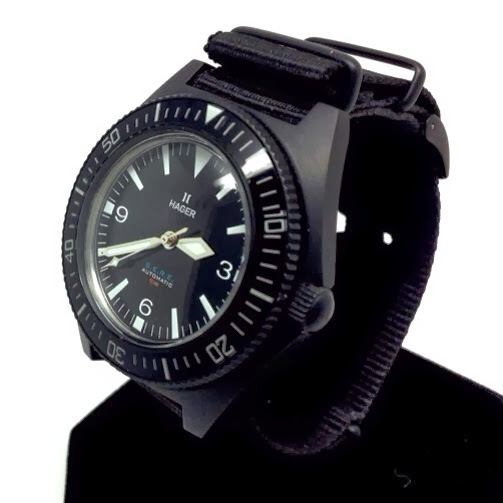 The black dial is the familiar diver style with polished markers and sword hands, surrounded by a stainless steel flange. The 3:00 date complication is white on black and blends seamlessly into the face. 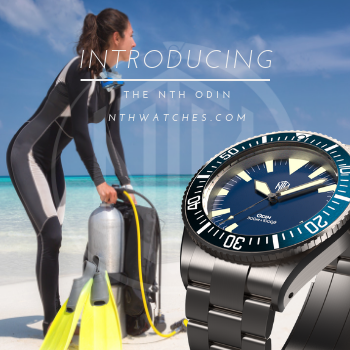 It is a bit heavy on decoration with its dive mask, brand, model, water resistance (100m), and circle-T, but these elements are well balanced and do not crowd the dial. The case back is etched with the image of a Fairbain-Sykes commando knife. A black NATO strap underscores the martial theme. 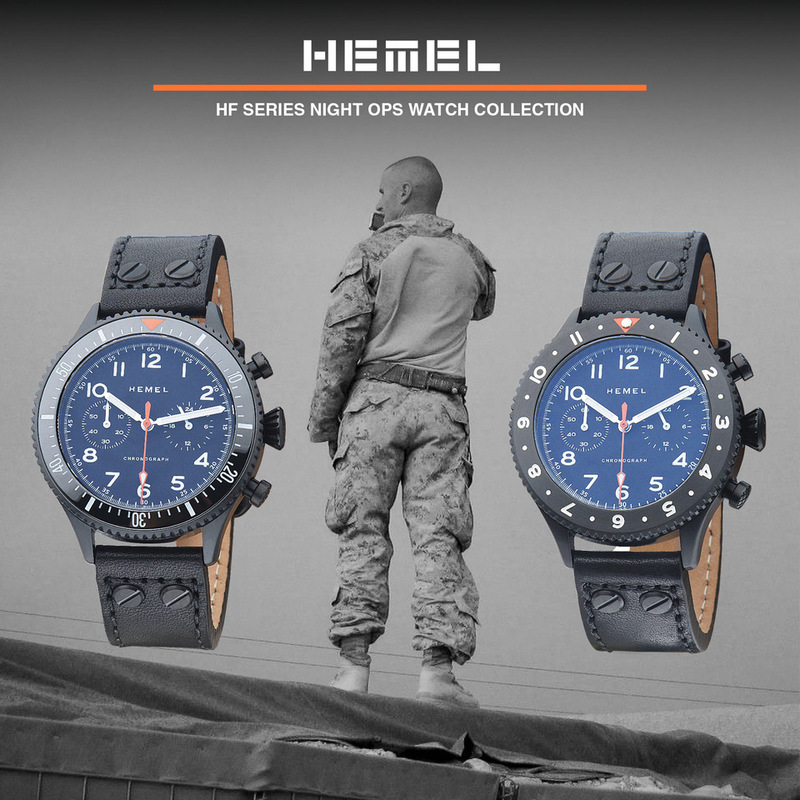 Many of Hager's clients are active duty military, and the watches see hard use in the field. Pete recalls one customer who sent his watch back for servicing after a combat tour in Iraq. The case, bezel, and crystal had taken some lumps, but he made Pete promise not to fix anything cosmetic. "Those were his memories." Hagar's 12 month warranty excludes damage from misuse or abuse, but Pete says he tries his best to make things right with every customer. His favorite? "The guy who said "I burned up my watch." I mean, how do you even do that?" Pete's military roots are an essential part of Hager's identity. 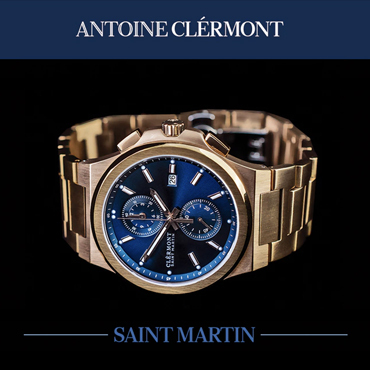 He is proud of his service, which is reflected in the majority of his watches' designs. The S.E.R.E. (Survival, Evasion, Resistance, Escape) is a tribute to the Benrus Type 1, issued during the Vietnam War. Two versions are available: a bead blasted case with a 12 hour bezel for $450, and a black PVD case with a 60 minute bezel for $550. Both designs are attractive, but the Stealth model looks particularly sinister. In all other respects, they are the same. They feature a monocoque stainless steel case, 42.7mm wide with fixed 20mm lugs. Despite the one-piece case and screw down crown, water resistance is surprisingly only 50m, which Pete maintains is more than adequate for daily use. Movement is a HGR48, which is an ETA 2824 blank assembled and modified by a third party. It is a stunning watch. The black dial is "Explorer" style with white Arabic numerals at 3, 6, and 9, and an inverted triangle at 12. The sword hands are also white. There is no date complication. A domed acrylic crystal completes the vintage look. It is an appropriate size for a modern tool watch - considerably larger than the Benrus, but not oversized. 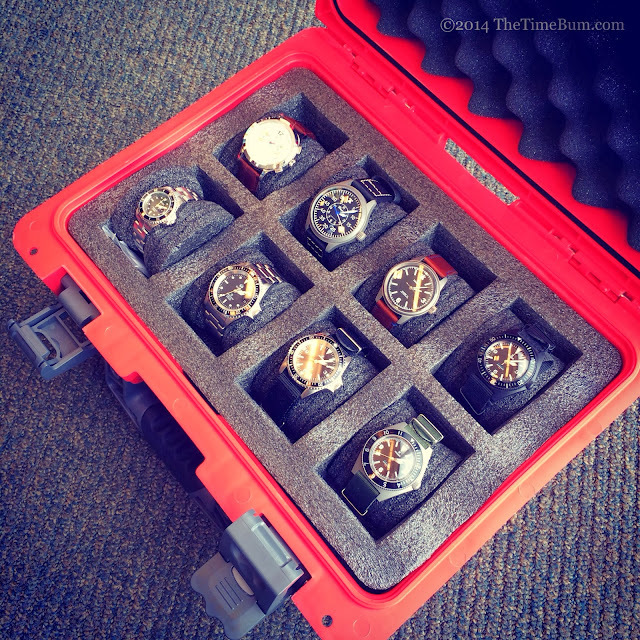 "This one case maker told me I’ve got to do big watches." Pete gestures like he is putting a hockey puck on his wrist. "Big, like 50mm! But I just don't get it. I'm not interested in anything that huge." In the meantime, he continues to develop new Hagers. 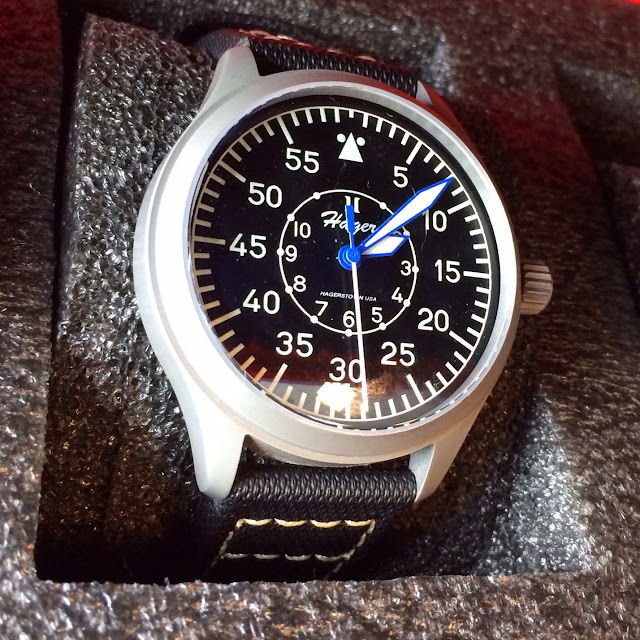 The Mark V Aviator, introduced at the end of 2013, was inspired by vintage pilot's watches. 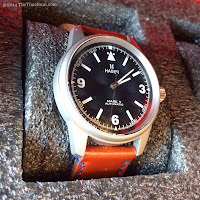 Like the S.E.R.E., it uses the HGR48 automatic and follows the Explorer theme, but trades sword hands for batons and tops the dial with a flieger's dotted triangle. It has a domed sapphire crystal, leather strap, smooth bezel, and a nicely decorated case back, engraved with World War Two pilot's wings. The round case is bead blasted titanium and only 39mm wide. 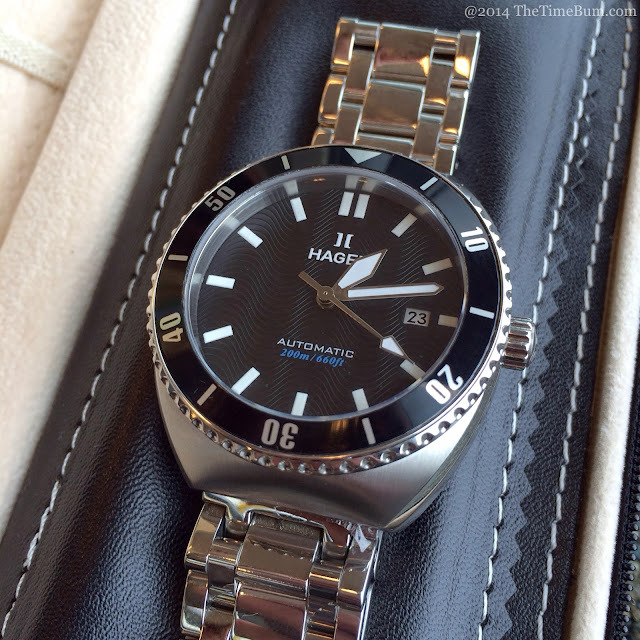 It has a utilitarian style, but it is a bit more sophisticated than the rest of the Hager line. It is also more versatile. I could easily see it with jeans, khakis, or a suit. Only 80 were produced, and there still some in stock for $380. It is my favorite Hager in production. Note that caveat, "in production." Pete has been kicking around some interesting ideas. He showed me a beautiful B-dial flieger with blued hands, domed sapphire crystal, and bead blasted case. He also had a brushed version of that case mocked up with the diamond crown, but the real fun was in the small travel case he pulled out when we were talking to the waiter. This prototype, the Triton, has a barrel shaped case inspired by 1970s sport watches. It is easy to dismiss that decade as the time of disco and leisure suits, but it was also a time of great experimentation and innovation in industrial design, especially watch design. It is good to see that the best of the era is now being mined for inspiration. The 40mm stainless steel case falls away from the center in a smooth arc, tapering to hidden lugs. The upper surface is brushed and the sides are polished. The rounded shape gives it an organic appearance, like a pebble fished from a river. It also makes the case appear deceptively high, even though it is only 13mm thick. The dial is black with a wave texture and simple rectangular hour markers. There is no chapter index. A black on white date wheel peeks through at 3:00. It bisects the marker, but because it is so close in color and shape, it does not disrupt the symmetry of the dial. Text and branding is kept to a minimum. A black dive bezel and flat sapphire crystal tops it off. A 5mm crown occupies the 3:00 position, and it is slightly recessed into the case, lowering its profile when it is screwed down. Water resistance will be 200m. 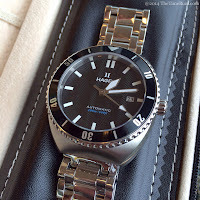 It is very much a sport watch, but one that will easily work with a suit. In a first for Hager, it is powered by the high beat Miyota 9015 automatic. "I love the ETA 2824," says Pete, "but this Miyota really makes you think. It's smooth as glass." The Triton is still a work in progress. 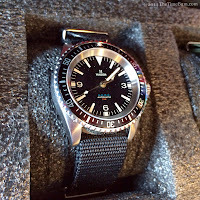 Right now it wears a steel dive bezel, but Pete is considering other options, possibly ceramic. Personally, I would love to see a domed crystal that would continue the arc of the case. The bracelet is brushed and polished, and finished to a high standard inside and out, even inside the butterfly clasp. I could easily imagine it on a nylon NATO, or a large-hole rally strap. Price has yet to be determined, but is expected to be in the same affordable range as the other Hager models. So getting back to our waiter's question, what is Pete's favorite watch? "I really admire guys like MB&F who are doing things way outside the box. Or Devon here in the U.S." he says. "I'd love to do something like that. Team up with a designer and do something totally different." He continues, "There are so many watches that are just packaging for off the shelf movements" he says. "There is nothing wrong with them, but the best watches are works of art right through: Vacheron Constantin, IWC, Glashütte, Patek Phillipe. These are heirlooms that you pass down the generations, but it's more than that. Watches are connected to us, part of our history. Your grandfather's watch may not be anything expensive, but it will be the most valuable in your collection, because of the memory."